Kostelowicz and I listen to the radio on Sunday nights until two o'clock: My eyes become glazed and prickly like dusty grapes, but Kostelowicz has long ago abandoned regular patterns of sleep and wakefulness; he's eighty-one years old, he's outlived the entire concept of circadian rhythm. We tried to watch TV onceKostelowicz has cablebut it didn't work out. Two minutes of MTV and the fifty-one years between us reared up like a thousand-year war. It was Madonna who did it. There she was, backlit like a gem on velvet, wearing a gold leotard with breast cups engineered by some demented Frank Lloyd Wright disciple. The music was thumping and she was running her hand up and down between her well-articulated thighs. Kostelowicz gave a disbelieving bark: "She's playing with herself!" "You can look at it that way," I said, "or you could look at it like a cultural critic and say she's redefining the metaphor of female sexuality as it's traditionally been presented to us." "I wouldn't say anything ungentlemanly, Gloria," Kostelowicz answered, gripping his walker with knucklebone hands, the backs of which are speckled and fierce, like mackerel, "but you're a thirty-year-old woman. You've been married and divorced, you've lived in the world, you know perfectly well (a little clank on the floor here with the walker) that woman is playing with herself." "Well, she's one of the richest women in America," I mentioned. "She's worth hundreds of millions of dollars. She has an incredible amount of power." "Turn off that box," Kostelowicz sighed, "I'm going to have a heart attack." I turned off the tube and switched on the radio: KTLO and the Señor C6mico show. Not that I stopped talking. Kostelowicz is an old man, without many visitors. He doesn't mind if I talk, he doesn't mind being badgered by my worldview, which changes from minute to minute, depending on what comes over the airwaves. In this way he's what I've always longed for: a captive audience. When I was a child I couldn't sleep at night. Nothing terrified me more than being awake, in my room upstairs, after my parents and everyone else in the city and on the planet was asleep. Even with the light on I seemed to inhabit a world of inanimate objects: furniture and the cold white streetlights outside combined a lack of emotional existence with malevolent intent. I didn't know that was a paradox; I was eleven years old. The lamps, the bookshelves, the windows seemed to take on sharp edges and to wish me evil. Thinking about the furniture would lead me to thinking about death; when I was dead I wouldn't exist any more than a marble vase would, and it would be forever. I was afraid of death, and I felt that things wanted me dead. Every creak, every sound of settling floor-boards would make me shriek. I often cried and called for my mother, shamefully pleading for her to wake up and come into my room. She would bring warm yellow light flooding into the doorway and make me forget instantly that there was going to be an end to anything. But she also needed her sleep and was starting to get upset with me. If, by an act of sheer will, I managed to let her sleep through the night, I would huddle under the sheets whispering dramatically, "morning, morning, wont you ever come?" 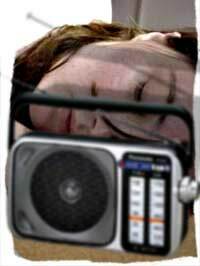 That year, in one of their many attempts to make me happy and keep me safe at night, my parents bought mean AM/FM radio. The idea was for me to be lulled to sleep by the music, but that was not quite how it went. I kept the volume low until eleven when I knew they had gone to bed and were no longer listening for signs of nocturnal activity from my room. Then I'd turn it up as far as I dared, which wasn't much, and lie on the floor with my ear to the speaker for the next three hours - at least until two, when the DJs changed shifts. Then, bleary-eyed and bleary-minded, I'd turn it down until I could hardly hear it, but never off. Turning off the radio was like turning off the lights or letting a campfire go out in the forest; it would let in the night and a world where no one, not even my mother, would love me. For the first year I listened to the local pop station, taking comfort that the cheerful, idiotic sounds of reality and commerce continued even when the world outside was empty as the moon. I liked the commercial jingles, the hearty baritones, the seamless, invisible transitions from weather to sports to Three Dog Night. I knew all the lyrics to the chorus of every top-ten on the charts, and the more they played a song, the better I liked it. Hearing a song played three times in one hour was like seeing a friend 'round the corner in the lunchroom. No elaborate greetings were necessary, but it was somehow reassuring. The time would pass, and I would full asleep safely, encircled by silly, happy sounds. I was still hollow-eyed and drowsy all day at school, but at least I was no longer terrified all night long. When I was twelve or thirteen I started to explore new territory on the dial. At first Id turn quickly back to my home station; what I heard on the others made me edgy. The songs were longer, more instrumental, sometimes eerie. It took me a few months of quick and timid listening experiments before I could leave the dial on WCOL, a station I'd heard called "progressive" by the college girl who helped my mother out on Tuesdays. I got it: music for older kids, even grown-up people like the college girl, who smoked marijuana, wore Mexican jewelry, and had jobs working with the poor. The kind of people I would someday be just like, if didn't become the only girl in the world to die of a heart attack before her first period. Once I was able to categorize their target audience, the whole idea of long instrumentals and mysterious segues became familiar, nonthreatening. In this respect, at least, I was an average American child, media-savvy and nervous. What made me feel most savvy and excited was a breathy-voiced DJ who did the ten-to-two shift on weeknights. She began each shift with Andean flute music and a Kalilil Gibran poem, which, at the time, I thought was wonderful. Due to the insinuating, ragged breathiness of her voice, she got a lot of correspondence from her male listeners, often men who were incarcerated in one of the penal institutions within the station's broadcast range. I liked it when she read their intense and lonely postcards on the air, but what I liked best was when, about halfway through her shift, she would exchange some banter with her engineer, Frank. "Here's Frank, bringing me a cup of the world's worst coffee. "What's for lunch today Frank?" "A tasty grinder from Lenny's. Eggplant for me, you get the vegetarian moussaka." "How's Lenny tonight? I imagine he's devastated about the Mets' recent string of disasters." I imagined myself at 2 AM, sitting in the sound booth with my fashionably cowboy-booted feet up on some convenient surface, tossing friendly jibes back and forth with Frank about baseball, delis, and vegetarianism, and the definition of cool. I started making up my own radio station, W-L-U-V, W-LOVE, and in between French and math I'd sneak into the bathroom, look in the mirror, pack my voice down a couple of registers, and say, "This is Glory, coming to you on W-L-U-V, reminding you that life is just one stop on the longer journey. And speaking of journeys, we're going to be taking a little trip with the latest from The Moody Blues." Of course, the popular girls overheard me doing this and proceeded to make my stop on the journey a hellish and humiliating one, but I was too sleepy to care much. Often I didn't turn off the radio at two, but kept listening, just one more song after one more song all through the next DJ's shift. My mother woke up early one morning and came upstairs to see me on the floor, knees hunched under flannel nightgown, staring at the glowing green numbers on the radio dial. "My God," she said, "have you been up all night? You have. I can tell by your eyes. You look like a fruit bat." Then we leave the station's broadcasting range, and all we get is static, a steel-wool carpet of meaningless sound. It's an irritating noise and it lasts for seventeen years. When we finally pick up something intelligible, I'm in a boardinghouse in St. Paul, sitting in a room with an old man who's abandoned regular hours. What were they playing when the signal was down? Nothing that needs to be heard, and nothing to sing along with, certainly. let's just say that the way I kept listening to just one more song was prophetic of my later inability to resist just one more of anything. This inability made it necessary for me to come to St. Paul. I'd never counted on living in this place, where the cold smashes you in the face every morning as if you'd walked into the side of a meat locker, but I hadn't counted, either, on wanting to live. It seemed like such a piddling ambition, like longing for a career in data processing. Especially for someone like me, obviously destined for greatness. The truth is, I'd had it with greatness of any kind, and I was happy not to wake up in the morning with a knee-twitching spasm. I was happy not to wake up ashamed and desolate, in desperate need of money. I was happy to have a room at West Seventh, a boardinghouse divided into bedrooms with sinks and floored entirely in dark-green wall-to-wall that smelled like fungus. It was my room, I earned it, and because it was mine, I thought it was pretty. I didn't meet Kostelowicz until I had been there for two weeks. He had the whole top floor to himself, with his own kitchen and separate entrance. He seemed to avoid the other tenants, who consisted mainly of outpatients from various state-run facilities. There were two men who, through the miracle of psychotropic medication, managed to appear simultaneously both doughy and thin, and one woman, obese and defensive. When I first moved in I tried to organize Monopoly games and offered to share my meals. It soon became clear, however, that this was only an intrusion, another demand. The house, always kept dark to save on electricity, was what they would come home to after working all day at fast-food restaurants. They would sit, exhausted, in front of the TV, eating their take-home dinners. In the dark living room they would watch the colored lights and let the volume batter them until, one by one, they drifted off. The TV was on eighteen hours a day, the only light in the house. Sometimes, from my room, I could hear the man downstairs barking in terrified laughter, or crying. "Don't . . . don't . . . I didn't." Well, what did I think it meant anyway, to be sick? One thing it meant was that you were alone. I was always one to blithely deny the facts of damage. At least everyone in the house had a job, including, most of the time, me. Sometimes that's the most you can ask, and sometimes that's asking quite a bit. Not that I didn't have any friends, but I didn't like it at night, in the winter, in St. Paul, sitting in my room with a book, listening to the TV downstairs blaring the sound of exploding helicopters. Which is why when Kostelowicz caught sight of me coming up the back stairs and asked me in for coffee and Bismarcks, it was all I could do to remember to hesitate. Old people scare me, especially old men. I suspected them of harboring sexual perversions. No, I'll be honest, I suspected them of harboring sexual drives which revolted me the way a sexual perversion is supposed to revolt you. After I checked Kostelowicz for any unsettling bulges, any suspicious gaps in his pajamas revealing anything sad flopping out of a mournfully sparse patch of damp gray pubic hair, I decided that he seemed in no way perverted. But listen, the truth is I would have gone in anyway. Some nights the idea of an old man playing with himself just didn't seem like that much of a threat next to an evening without human chitchat. His apartment was a surprise: It was not at all the dank, mildewed coven I had expected. In fact it was tastefully furnished. Of course by tastefully furnished I mean not furnished in the style of the working class. That's the kind of evil fascist I am. I doubt there's any hope for me. He had low-backed couches put out at angles and decent reproductions on the walls. On the end tables tall drinking glasses held fresh flowers. "The Meals-on-Wheels girl is so kind to bring them," he told me when I let him get a word in edgewise. Of course I talk too much when I'm nervous, so you can imagine how I let the words fly at the old man, setting them loose like birds. I filled the room with piping, fluttering words, so that he wouldn't know that Gloria Bronski, babbling desperately for the past ten years of her life, had forgotten, if she ever knew, what to say to another human being. Kostelowicz laughed, sometimes, at my jokes, agreed with some of the things I said, and politely disagreed with others. Outside of customer service exchanges at various temp jobs, it was the first time I'd talked to another human being in almost a week. When Kostelowicz asked if I minded the radio on, I said, "No. The radio? Are you kidding? The radio's my favorite thing in the whole world." I meant it when I said it, although I hadn't listened to the radio since I was eighteen, and nothing except chemically-induced euphoria had been my favorite thing for a long time. I told Kostelowicz about my day during the commercial breaks on Night Talk. I tried to make it sound amusing, casting myself as the beleaguered heroine of a series of ludicrous mishaps on the way to a job interview. The interview itself was the real juice, though; I'd been saving the similes since three o'clock: "So after forty-five minutes this woman comes out, and I tell you she had the most enormous hair I've ever seen. You know the way they wear their hair now, like it's been laminated in the middle of being windtossed? Her smile is laminated, too. She's like a shiny smiling tombstone. Can you picture her? Like the Meals-on-Wheels lady if she was evil. She's got this high-pitched voice that sounds like taking shellac." Kostelowiczs head had dropped forward, his forehead a pale speckled globe, his eyes shut, his breathing almost a snore. I took a deep breath and looked around, in an irrational reflex, making sure that there was no one else in the room. I would have whispered what I told him next, but whispering was not in my nature. "The woman was fine, actually. She was nice. It was me. My shoes had mud on them, and I laughed too loud. I looked like a child. Anyone looking at me can tell I don't know how to do even the simplest things. I don't know how to drive, what to say, how to get in a checkout line at a convenience store. And besides, I'm ugly. I just want to sit on my bed and look at photographs of when I was little." I was alarmed at the tears, which I felt not in my eyes, but in my throat, like a sharp breath. Kostelowicz, who had not been asleep at all, but listening with closed eyes, cleared his own throat, and the tears vanished from mine. "Ridiculous," he said. "You're a lovely and capable young woman." "You don't know my whole story," I answered, starting to laugh. Kostelowicz snorted and said, "Well, I can imagine the worst. It still doesn't change my opinion." We quieted down for a while, listening to Night Talk. The show actually goes all night, live; the host does a seven-hour shift. He discusses a topic with a guest, then takes callers. Their voices come in over the line, awkward, breathless, incensed, having planned exactly what they are going to say. Sometimes they are the voices of people with rattlesnake minds, venomous and panicked; they feel cornered by Jews, Indians, blacks, women who have had abortions, all the people they think are going to take things away from them. They say things like, "I mean, basically they bring it on themselves. Everyone has the choice to follow God's path, or not, and this is what happens." More often, though, people call in with their opinions, their fears, and within limits, their fantasies; and it's nothing that no one's heard before, nothing earth-shattering or frightening or astonishing. They say things like, "If people could remember to be considerate," or "My wife and I were married for thirty-one years before she passed on and I'll tell you, the key is respect." What's amazing to me is how well I understand the impulse: It's one in the morning and you have an opinion. You are awake and everyone else is asleep. You work the night shift, or you work someplace where no one wants your opinions, or you don't know how to express an opinion; you're afraid you'd look crazy; standing there babbling about your opinion. It's been so many hours since you've talked to anyone that your voice cracks when you open your mouth to speak. You've looked out your window hours before and the neighbors were calling to their children and standing in their yards drinking sodas; you've seen a man and a woman walk naked through their kitchen and make sandwiches. Other people's conversations flow around you in currents, and you are a rock in the stream, a rock with an opinion. The DJ on Night Talk is good at his craft; he neither rushes nor indulges. I know his eyes are on the clock every second, but his voice is conversational. The people that call him are the people I would like to have a conversation with. I think, with the grandiosity inspired by a day of unpleasant job interviews, that I could cheer them up, make them laugh, make even the ones with violent minds see a little reason. "That," I say to Kostelowicz, "is the job I want." "So?" says the old man. He's put on his glasses and his eyes are huge behind the lenses; they look like two newborn things, his lashes gummed up and glistening. "It's not that simple," I said. "First I'd have to apply for school. They'd send me a hundred pages of forms, and I'd have to fill them all out correctly. That right there is a problem. Then I'd have three years till I got my BA, which would be just about worthless. I'd have to get a masters in communications, by which time I'd be thirty-five, and applying for gofer jobs at the local public service station, competing with people fifteen years younger than me for the same position." "Well," Kostelowicz said, "in my opinion, it's worth any amount of trouble." "Finding the right job. That would be the right job for you." "How on earth do you know?" I asked. "The way you light up my room," he says, "the way you light up my room with your voice." © Anne Marsden Emily Carter's award-winning stories have appeared in Story, Gathering of the Tribes, Between C & D, Artforum, Open City, Great River Review, and Poz, for which she was the cover subject of the 1998 summer fiction issue. Her debut collection Glory Goes and Gets Some features stories that were originally published in The New Yorker; the title story was selected by Garrison Keillor for Best American Short Stories 1998. The collection was first published by Coffee House Press, Minneapolis, U.S., 2000; Serpent's Tail presents the first U.K. publication, 2003. Emily Carter lives in Minneapolis.